Software-as-a-Service (SaaS) is the new topic of discussion in the market and CASB solutions help achieve security controls and eliminate the protection risk. CASBs work with the security blueprint of the cloud infrastructure and protect the data by collect and verifying the configurations on a continuous basis. Here in this article, we have outlined some tried and tested capabilities to utilize the Amazon Web Services applications to protect its infrastructure. The right CASB solutions help enterprises to heighten the security of their Amazon Web Services infrastructure and thus prevent data leaks. Know the Associated Risks and Remediate Them: Organizations depend on third-party for their various business needs. But, the point here is that the quality of the third-party’s security operation remains largely unknown and invisible to the enterprise. Thus, the risk associated with the third-party becomes the risk for the enterprise also. Here, it is important that enterprises demand certain visibility into their cloud infrastructure like where the information is being stored and the S3 buckets that are owned by the third-party. There are risks associated with it by enabling AWS users to modify permissions of the bucket, allowing read/write and some other mistakes in configurations. A CASB solution helps enterprises to get continuous data visibility along with exposure remediation. Monitor the Security Configuration on a Regular Basis: Any mistakes in internal Amazon Web Services infrastructure configuration results in data leakage. Not following the AWS security best practices or inadequate use of software may be the causes for data leaks. But, it is difficult to identify the mistakes and fix them later after the damage has been done. If any enterprise is to secure its data then it has to follow a break-free security rule monitoring especially if subjected to compliance, assurance framework and security challenges. Apply Structured and Unstructured DLP Applications: The main task of DLP policy is to secure the Amazon Web Services infrastructure. DLP helps enterprises to know where the sensitive data is stored in the cloud. An accurate set of controls can be applied to enhance the security of the cloud. Enforcement policies based on keywords, data identifiers, and structured/unstructured fingerprints is to be applied to prevent unauthorized access. The public data can be monitored using the DLP resources. There can be access restriction and security alerts for the confidential data stored on bucket. Continuous Round-the-Clock Monitoring: In any cloud service model, there has to be continuous monitoring of all the user-related activities. The enterprises have to select that CASB solution that supports AWS infrastructure and manages all API calls. It has to even console the commands that are performed by end users as well as third-party services. This helps the enterprises to get information about who, when, what and how. Threat Protection: The Amazon Web Services infrastructure security has to detect any anomalies in the working environment. Machine learning concept comes to the fore here to detect a combination of anomalies so that a sudden alert message is sent to the security team that will fix the threat. The CASB solution should correlate with the AWS activities to generate behavioral patterns under the cloud environment. Network Traffic Security Check and Remediation: AWS consists of native log of network traffic through the VPC and network flow logs. Any CASB solution has to protect the network traffic and provide cloud security so that risks can be identified at an early stage itself. It has to offer complete view of all the activities going on in the network to its customers. It has to identify whether the security groups are configured properly or not and include the analysis of security group of network. It has to check the allowed/denied traffic to see if the existing policies have been altered by the users or not. It has to give details about the ports and the set of resources that can be used in these ports. CloudCodes CASB solutions have all these mentioned aspects, which means complete security envelope for any organization that deploys our CloudCodes CASB solution. 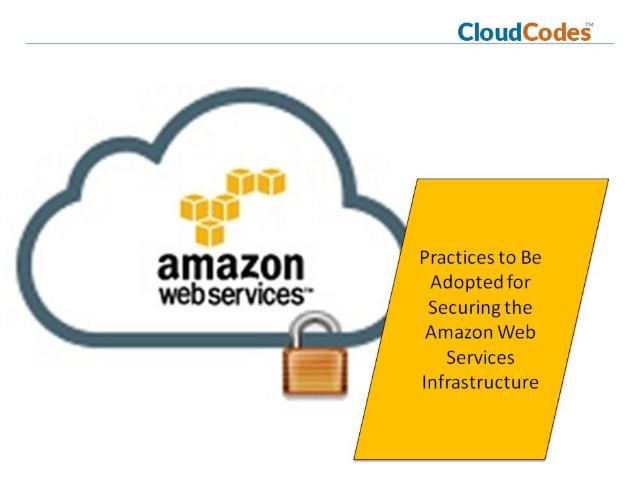 The security intelligence of Amazon Web Services infrastructure can be accelerated by the correct CASB solution like the one provided by CloudCodes. It helps enterprises to detect the incident instantly and remediate quick response, thus protecting the sensitive data in an effective manner.